I have been noticing a funny phenomenon recently in the work of my favorite science fiction authors. Their futures seem to be shrinking. 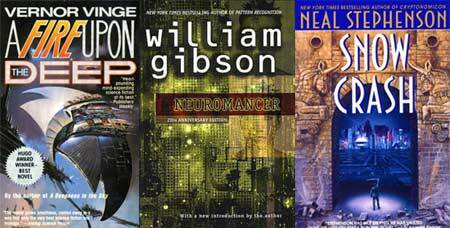 I thought it may have just been a coincidence that two of my all time favorites, William Gibson and Neal Stephenson, have both been writing less and less about the far future, and more and more about the near present (or even past in Stephenson’s case). But since meeting Vernor Vinge at one of our lectures, I have been reading his amazing work and noticing the same trend. I started with his most recent book Rainbows End (set in 02025), and recently started reading A Fire Upon the Deep published in 01991, which is set over 50,000 years into the future. Each of these authors cut their teeth decades ago imagining transcendent future technologies. They invented, or at least popularized concepts of things like cyberspace, the web, virtual reality, and the singularity. It seems that the technological developments of the last 10-20 years have caught up so rapidly that extrapolating on its current possibilities is either more interesting, or simply more imaginable, than postulating on what it might become. I still love all their work, I just wonder what it is that may be causing the future to shrink?